Intel has announced that it has adopted and started to introduce Windows Modern Drivers (WMDs) for its hardware products. One of the quieter changes in the latest Windows update was that Microsoft is moving to the use of Windows Modern Drivers for Windows 10 1809 (RedStone 5) and later. Just to confuse things these so called WMDs are also known as Universal Windows Drivers, or UWDs (which might be a better contraction, as WMDs is an already widely known acronym for something completely different). Thanks to the above method of driver development, the base driver can be widely tested and deployed by Microsoft via Windows Update and the OEM validates only the optional customisations which can come sooner or later, depending on the firm's priorities. Intel has already released its first UWD driver, its graphics driver for Windows 10 v 25.20.100.6444 for Skylake and newer CPUs. In the release notes Intel says that previous driver releases will be moved to Legacy status. To upgrade to the new UWD drivers users are asked to use the .exe rather than the INF/Have Disk method - to avoid system instability. Actually this is the only way that Intel is facilitating driver updates for the next few releases - an .exe will be provided but a .zip will not be. Lastly, if you want to roll back to Legacy drivers for some reason, please follow the instructions to avoid "minor to catastrophic issues on your system". 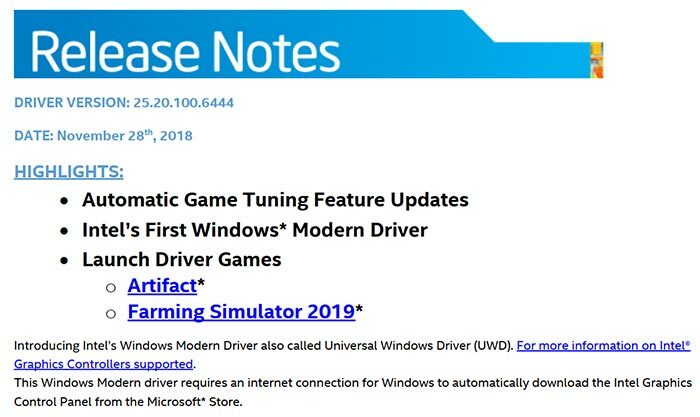 On the topic of this actual v 25.20.100.6444 driver release, Intel has included; Automatic Game Tuning Feature Updates, launch support for Artifact, and Farming Simulator 2019. Automatic Game Tuning now supports 12 more games as follows; Fallout 4, Far Cry 5, FIFA 18, Paladins, Path of Exile, The Sims 4, SMITE, Borderlands 2, Euro Truck Simulator 2, PLAYERUNKNOWN’S BATTLEGROUNDS, Rocket League, and The Witcher 3. 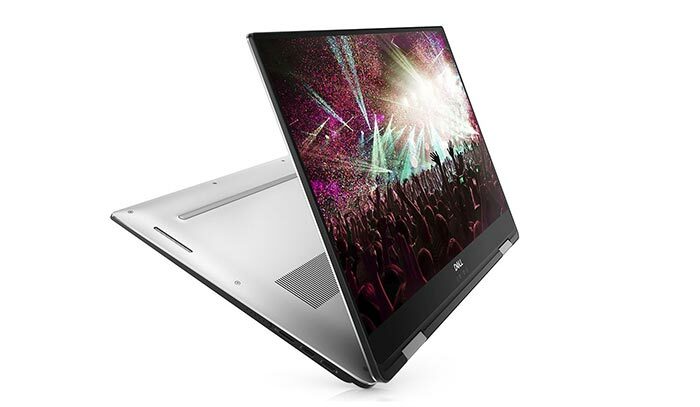 In addition to the above, the driver includes performance tweaks which will reduce RAM consumption when running OpenGL titles, increase battery life when using Display Refresh Rate Switching, and improve the stability of Vulkan games and utilities. If this is a driver that is applicable to your system (64-bit only) then it might be worth reading more about its finer details in the release notes (PDF). I suspect marketing weren't involved and hence it ended up with such a terrible name. Seems like a good way to force people into the Windows Store. Mandate that hardware vendors must now supply drivers in this format while telling them any supporting applications must be provided via the Windows Store. When the next version comes out, will they call it “Windows Moderner Drivers”? ?